The adviser admitted to TheDCNF that he got the facts wrong. Democratic New York Rep. Alexandria Ocasio-Cortez and left-wing group Media Matters teamed up to push a viral but inaccurate claim from one of her policy advisers about the contents of documents relating to her Green New Deal proposal. “Why would we ever pay people who are quote, ‘unwilling to work? '” asked Carlson, a co-founder of The Daily Caller News Foundation. “I, we, we never would, right? And AOC has never said anything like that, right? I think you’re referring to some sort of document that some, I think some doctored document that somebody other than us has been circulating,” Hockett answered, inaccurately. “No, no. She’s actually tweeted it out to laugh at it. If you look at her latest tweets, it seems that apparently, some Republicans have put it out there,” Hockett insisted. Ocasio-Cortez’s office did, however, publish a “Green New Deal FAQ” that said it guarantees “economic security to all who are unable or unwilling to work,” contrary to Hockett’s claims. Her office later deleted the FAQ. Screenshot from Green New Deal FAQ on Rep. Alexandria Ocasio-Cortez’s website. It has since been deleted. Saikat Chakrabarti, Ocasio-Cortez’s chief of staff, said in a series of tweets Saturday that the FAQ was published by mistake. It did not match the Green New Deal’s legislative text on aspects like welfare and nuclear power. Mistakes happen when doing time launches like this coordinating multiple groups and collaborators. It’s hard to have both a transparent and open process with many stakeholders while keeping all info locked down. But what’s in the resolution is the GND. 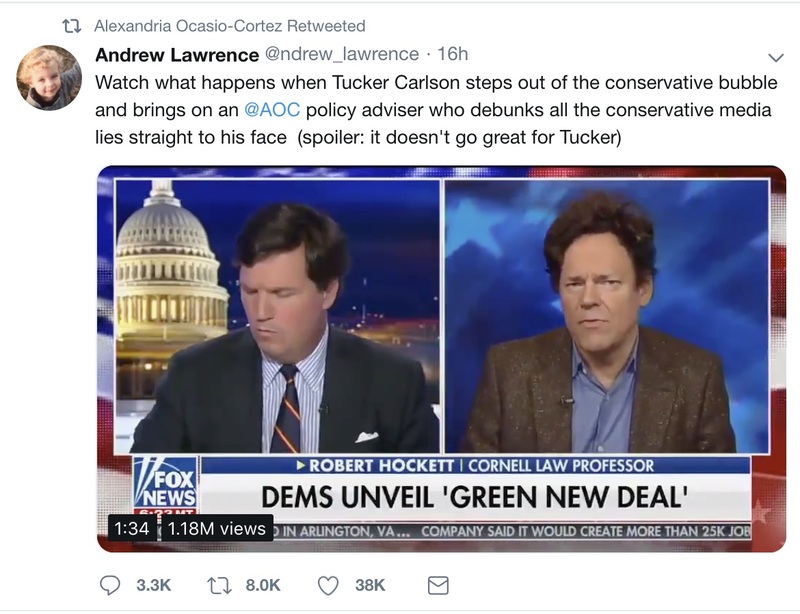 Andrew Lawrence, a researcher at left-wing activist group Media Matters, tweeted out a clip of Hockett’s inaccurate answers on Friday night, but claimed that Hockett had actually debunked “all the conservative media lies straight to [Carlson’s] face.” Ocasio-Cortez retweeted Lawrence’s tweet to her almost three million followers, helping the misleading video go viral. Hockett conceded that he was in the wrong in an email to The Daily Caller News Foundation on Saturday. Neither Media Matters nor Ocasio-Cortez’s office returned requests for comment by press time.